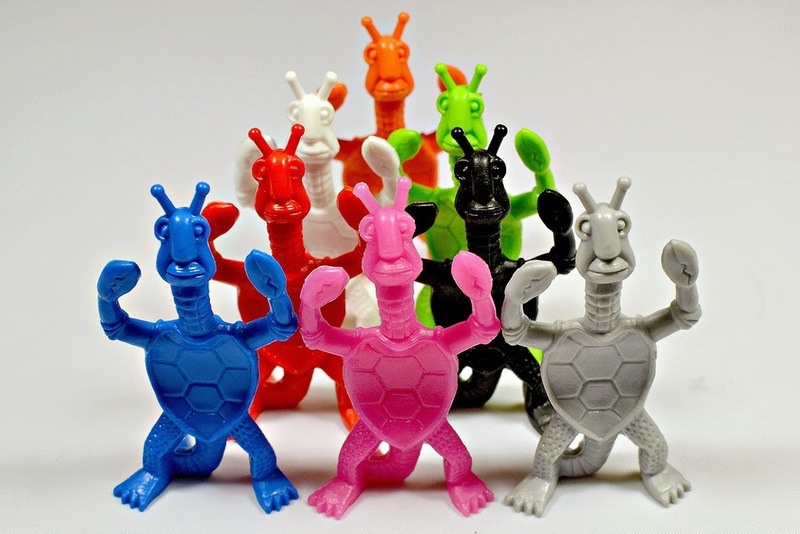 After a reissue in black and gray colors last year, the classic Tim Mee Toys space-fantasy mini figures from the '70s/'80s best known under the name Galaxy Laser Team are back again this year with releases in four new colors! 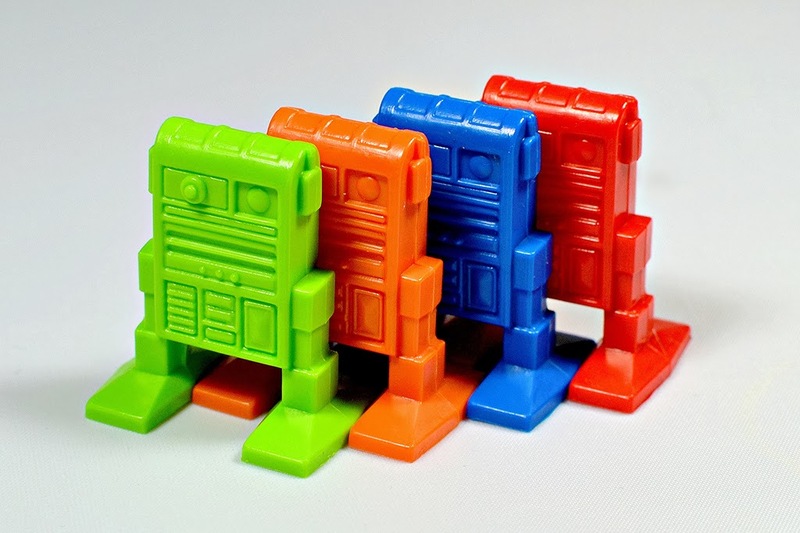 There are two new bagged sets of 50 pieces each: one with red and orange figures, and one with blue and green figures. The same characters that Galaxy Laser Team collectors know and love are back: the Darth Vader-esque villain, the fantastic lobster-turtle alien, the heroic space warrior, the space woman and her console, the Chewbacca-inspired space beast, the R2-D2 knockoff robot, and the two different astronauts to round out the set. 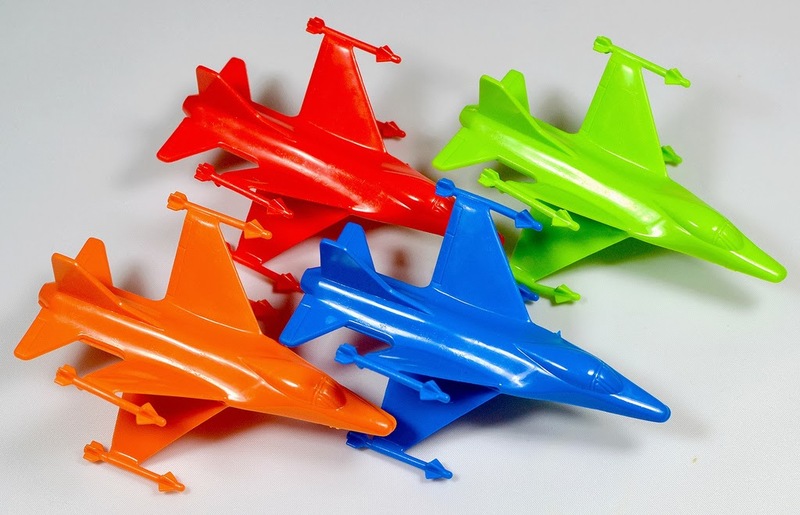 Each set also comes with spaceships in corresponding colors. If you prefer brightly-colored mini figures like I do, you should be very happy with these reissues. 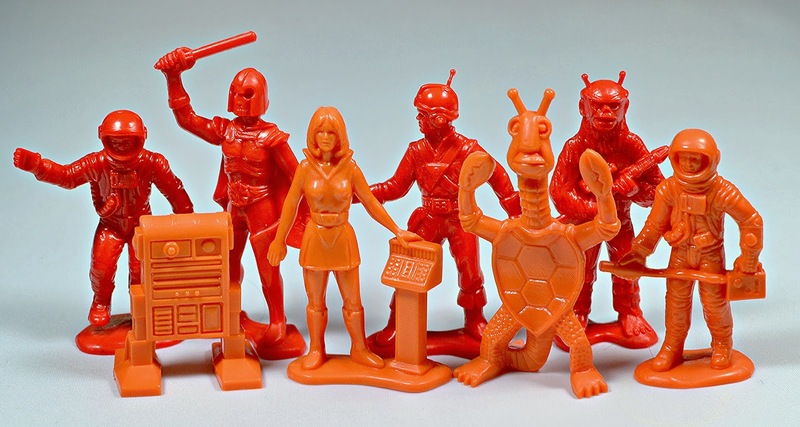 The orange and red set is my personal favorite--I love the combination of these warm colors, and the figures really pop in them. In fact, orange might be my favorite Galaxy Laser Team color to date. 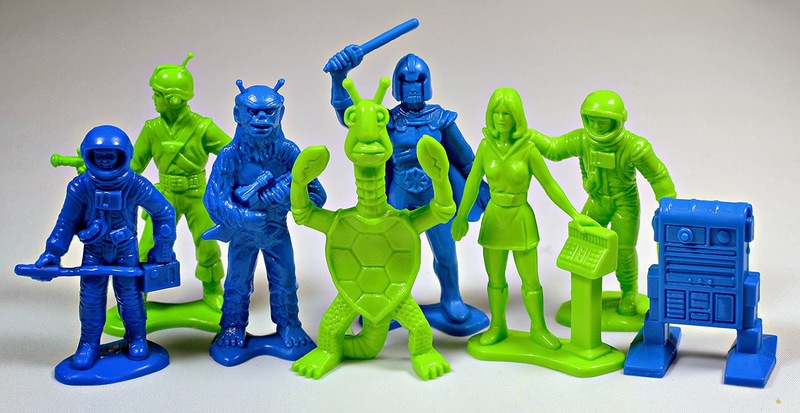 The blue and green set is great as well, although a similar green was used in old Galaxy Laser Team releases, so if you own some of those already you probably won't find it as exciting as the other three new colors. Once again, these reissues come via J Lloyd International and VictoryBuy, and are available for around $12 per bag on Amazon (you can find the red/orange set HERE and the blue/green set HERE). Be sure to check out the Tim Mee fantasy warrior figures that were recently reissued, as well. I love the fact that these figures are back on the market in multiple colors, and hope new ones continue to be produced. I'd love to see a purple/yellow set, or maybe even some transparent or glow in the dark colors. I want to create an army of lobster-turtle aliens in as many colors as possible! I've been seeing those astronauts around the internets It's nice to know what they're from! The turtle lobster men are far out! Yeah! I think the astronauts might have originated in an older set from the '60s or something, but the Galaxy Laser Team versions probably show up most often. How does the reissue green compare to the old green? Is it a different shade? It is similar, but slightly lighter and more opaque than the older green ones I have. Thanks. I remember these from when I was a child. Picked some up on Amazon and am debating whether or not it's worth it to buy the older versions as well.